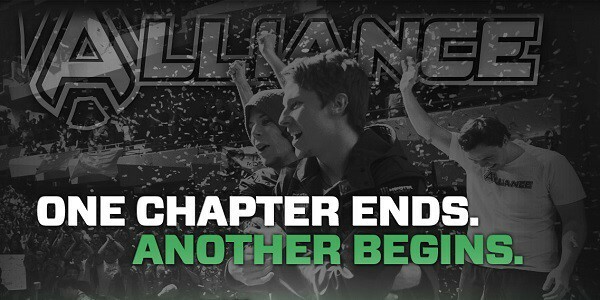 Eighteen months, ten titles and one International victory after the roster first came together, Alliance officially announce they will be changing up their squad with EGM and s4 both leaving the organisation. The roster that took The International 3 by storm may be gone but they will never be forgotten. A fresh start for Alliance. "This atmosphere of friendship, without any doubt, was a major contributing factor in the team going without a roster change for more than 18 months," said Alliance on a befitting farewell page for their two long-serving members, "which by our count makes it the longest-tenured lineup in the history of professional Dota 2. And the players' close personal bonds make this announcement all the more difficult, but ultimately still necessary." Despite an incredible 2013 which witnessed Alliance win The International 3, StarLadder and DreamHack Summer, 2014 was not so fruitful for the team. A shock exit in The International 4 before the playoff stages was just one of the lows, and although the organisation announces the departure of EGM and S4, it appears to be with no hard feelings. As part of their official announcement they included the following videos as well as statements from the remaining players. I do not really know how to begin a statement like this, because I haven't really been in any situations like this one before. This is the end of an era, but I'll start at the beginning. Two years ago, after a so-so performance at TI2, I set out with the goal to build a team that I could call my own, with people that I respected and could grow to be friends with. I wanted a group of people that were not going to stop at anything to achieve our goals. We did not set our goals low - we aimed for the top, and we reached it. S4, we have been through so much together, and in a way I feel a bit disappointed that you wanted to try your luck somewhere else. In a way, I want to be angry at you, but we are friends, brothers, and we traveled the world together as champions. I cannot do anything other than respect your decision, even if I still don't agree with it. EGM, you were someone I really fought to originally bring onto the team. We had so much fun playing together for all those months prior to you joining, and then also onwards. Together, we made up one of the most feared dual lanes of 2013, whether you were on Windranger or Wisp. I am very happy to have had the chance to help form you as a player, and I am proud to call you my friend. You were my "chosen one" when it came to support, but just like Obi-Wan and Anakin, I guess some duos are not meant to be together forever. We had a good run, and now I wish you all the success, wherever you decide to go. As we say goodbye to both S4 and EGM, it feels like we have lost a part of our identity as a team. But even though it's always sad to say goodbye, I've always felt confident in my ability to build new teams. And with the company of my long-time partner Akke, and man's best friend Bulldog, we all feel confident together. We still have the same fire in us as when we first started off as No Tidehunter in 2012. We will find two new players, and reform ourselves as a team. We will find the new blood we need to begin anew, and we will prove ourselves out there rather than resting on old achievements. We will change, but we will still remain the same. We are Alliance. AdmiralBulldog's, Akke's and Kellymilkies' statement on the official Alliance farewell page.